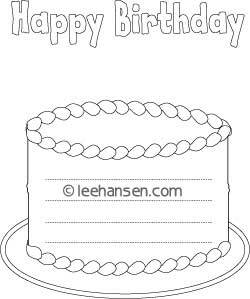 Birthday coloring and writing activity sheet, printable coloring page with a picture shaped like a birthday cake with lines for writing inside the cake outline. Add your own candles to the birthday cake! 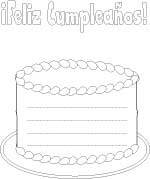 Printable birthday cake shape paper coloring sheet with guide lines for writing Happy Birthday greetings. The printable coloring page will not show printed copyright lettering on the picture. Feliz Cumpleanos Happy Birthday bubble letters at the top of the page ... Spanish language version of the birthday cake writing paper above.